Apologies for the photo, I ran out of daylight so I had to take it on the windowsill. It's pretty much impossible to take a decent photo past 4pm these days! It's our final week with the talented Angeline Yong as our muse at CASE Study! It's been a fabulous month of inspiration. Check out Angeline's card this week. I CASEd the background color, Swiss Dots embossing folder, layout and position of sentiment but I went for a more shabby, feminine look. 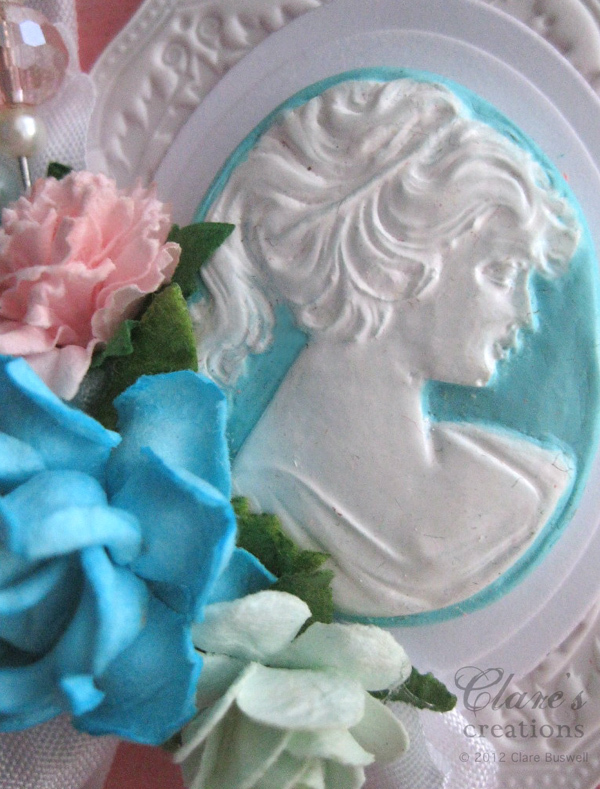 The cameo I made with a silicone mold, polymer clay and I painted it. 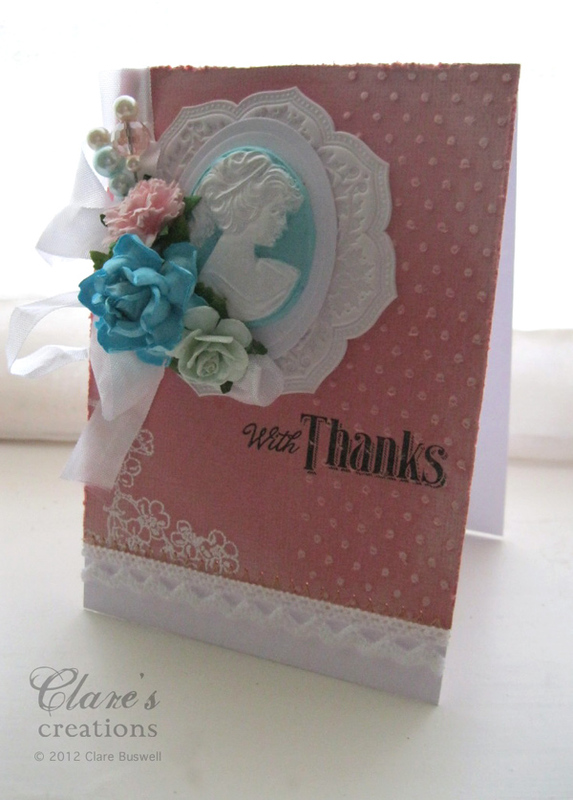 The flowers are from Wild Orchid Crafts. I layered the cameo onto a die cut oval on top of an Artisan Element from Pink Paislee. 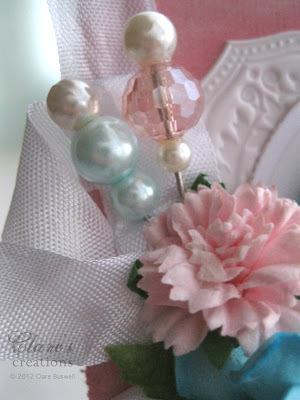 The trinket pins are from my Etsy shop, Powder Blue Pearl Trinket Pins and Salmon Pink Pearl and Crystal Trinket Pins. The sentiment is from the Camellia Stamp set from Waltzingmouse Stamps. Don't forget to check out the creations from the rest of the CASE Study design team, they are amazing! 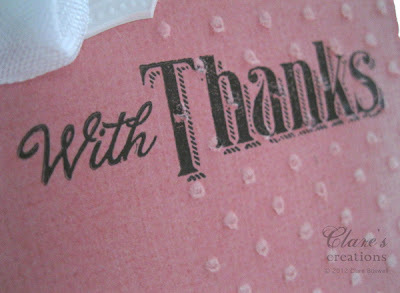 I'll be back in just a little while with my samples for the Waltzingmouse Stamps December Release Day 2 previews. I can't believe you were willing to put all those goodies on one card. I could never give that away!! If I did, I would pluck a few pins and the cameo off!!! hehe.. Thank you for your encouragement on my blog. I tried to write back, but didn't have your email, so here it is! Blogging is so unpredictable isn't it? Thanks for sharing with me. As a newbie, I really appreciate people out there saying it happened to them too. Makes me not feel so alone in the reject "boat". Blogs are such a personal thing and a sharing of ourselves and what we love, so thank you for taking the sting out of it. I will be better prepared next time (hopefully there won't be a next time, but I am less naive about it now). I heart Case Study! You all bring such different wonderful styles each week. It's why I love it so. Your cameo card is absolutely breathtaking! I love it, Clare!